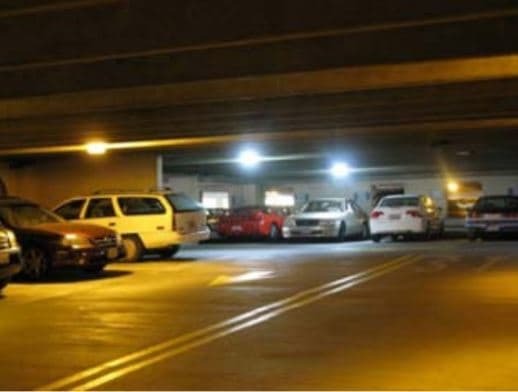 In June 2016, the American Medical Association published a set of guidelines to help lighting designers choose lights that maximize effectiveness and efficiency without causing harm to living organisms. After a recent article about LED streetlights, I fielded a few questions about the possible adverse effects of LED lighting. 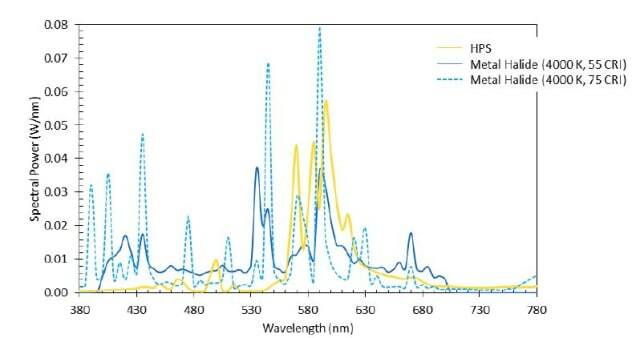 I knew that the AMA report cited lights with a heavy blue content, like "cool white" lights with color temperatures above 4000 K, but I was unaware of the subtleties in the color spectrum associated with lights. Recently, the US Department of Energy - which still exists at the time of this writing - published a very enlightening 18-page document that covers the issue in detail. Here's a synopsis of that report. We all learned in school that white light is a blend of all the colors of the rainbow. Like the sun, all artificial light sources - incandescent, fluorescent, high-intensity discharge, and LED - produce a broad spectrum of light with various levels of each color. But the "ROY G BIV" colors merely represent our conscious perception of the light that we see. Light is an electromagnetic wave, with different wavelengths of light appearing as various colors to our visual receptors. 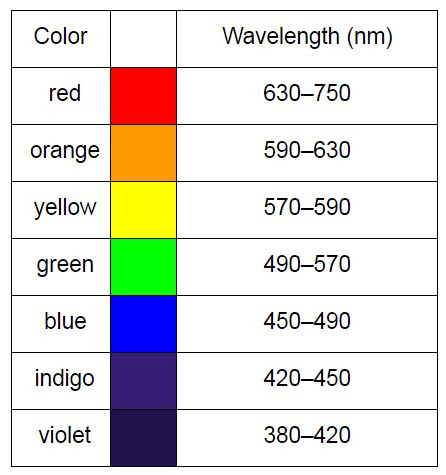 As you can see in the table, each color spans a range of wavelengths. What we call "blue" is any light wave whose wavelength is between 450 and 490 nanometers. Even the range boundaries vary depending on which physics textbook you're consulting. Most light bulbs are designed to emit white light, but there's more than one kind of white. For example, cool white bulbs tend to be heavier on the blue side of the spectrum, while warm white bulbs lean toward the red side. We often use the term "correlated color temperature" (CCT) to represent each color with a number. According to the DoE report, "CCT is expressed in kelvin (K), and the value corresponds to the color of light emitted by a heated mass (a theoretical blackbody radiator) at that physical temperature (although the light source is not actually operating at that physical temperature). So an LED with a CCT of 3000 K will appear to give off a color of light close to that of a tungsten filament operated at a physical temperature of 3000 K (tungsten being very close to an ideal blackbody radiator)." The problem with CCT as a metric is that it doesn't convey enough information because a color is really a blend of many wavelengths. When scientists break light into its component wavelengths, they produce a spectral power distribution - a graphical representation of the different wavelengths of light and the intensity of each wavelength. Below you see the spectral power distributions for three different light sources. The eyes have receptors that detect different colors, and scientists have recently discovered receptors that affect the brain outside the visual cortex. In other words, they detect light but that light is not perceived visually. Evidence suggests that these receptors, whose sensitivity peaks at light levels around 480 nm (the high side of blue), may affect circadian rhythms. Why Not Go With Warmer Colors? Advances in LED technology can bring us the best of both worlds: effective lighting without the health issues. LEDs can be tuned to emit particular wavelengths, allowing engineers to design lighting systems that produce cool light while minimizing the narrow range of wavelengths that affect sleep cycles. Since cool lighting is more effective, lights don't need to be as bright. In fact, streetlights can be dimmed late at night to save energy and reduce the impact on circadian rhythms. 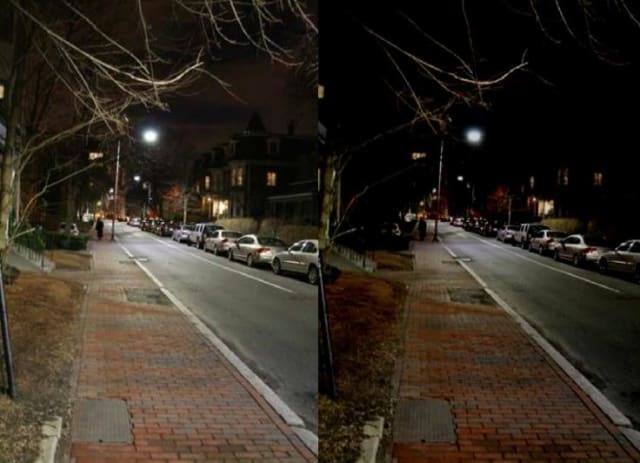 Cambridge, MA dims its streetlights after midnight, with no complaints from residents. While concerns about LED streetlights are somewhat valid, you don't need to worry about them turning you into a sleep-deprived zombie. (That's what your smartphone is for.) With proper attention to a light's spectral power distribution and brightness controls, engineers have the knowledge and tools to design lighting that's safe, effective, and energy efficient. Score another point for science!